GRAMMY WINNERS From Reality Competition Shows- IDOL, THE VOICE & Movies! He’s not new to R&B, but new to NBC’s hit reality singing competition show THE VOICE, Usher won a Grammy for Best R&B performance with “Climax” from the track “Looking 4 Myself”. Other realty competition show winners came from AMERICAN IDOL past. 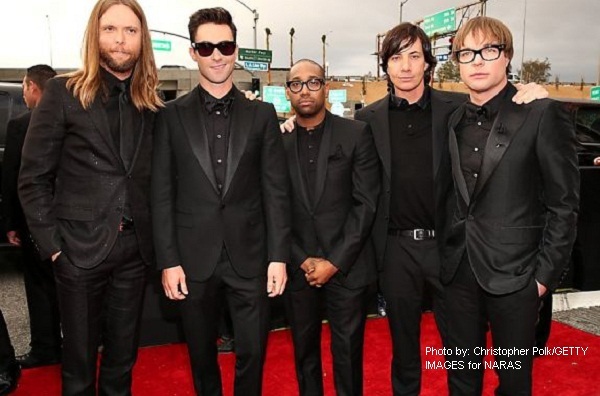 Also from “The Voice”, show coach Adam Levine was nominated with his band “Maroon 5” for Best Pop/Duo Group Performance with “Payphone”. The winner that beat them out was Gotye Featuring Kimbra with “Somebody I Used To Know”. Pictured: AMERICAN IDOL winner from season 4, Carrie Underwood arrives at The Grammys 2013. In the country category, winners and nominees from singing reality competition shows was abundant. The winner of Best Country Solo Performance was Carrie Underwood with “Blown Away”. Underwood won the fourth season of “American Idol” in 2005. Previous to this year’s Grammys, she has won six other Grammys. Underwood was up against fellow reality competition show country singer celeb Blake Shelton from “The Voice”. Shelton was nominated for “Over”. By-the-way, “Dierks Bentley” was also nominated in the same category with “Home”. “Dierks Bentley” is regularly featured on CMT’s singing karaoke game show “The Singing Bee” when contestants have to remember the lyrics to their song and “sing it right”, or get eliminated. Carrie Underwood picked-up another Grammy as a songwriter on “Blown Away” for Josh Kear & Chris Tompkins. On the feature film side of things, “The Girl with the Dragon Tattoo” won for Best Score Soundtrack For Visual Media composed by Trent Reznor and Atticus Ross. “Safe and Sound” won for Best Song Written For Visual Media from “The Hunger Games”. The songwriters for “Safe and Sound” are: T Bone Burnett, Taylor Swift, John Paul White & Joy Williams. “America Idol” judge and actress, singer Jennifer Lopez showed-up to The Grammys in a daring dress with a slit that challenges that of Angelina Jolie’s from The Oscars 2012 (see photos below)! Pictured: AMERICAN IDOL judge (and triple threat extraordinaire) Jennifer Lopez arrives at The Grammys 2013. Pictured: Angelina Jolie arrives to The Academy Awards 2012.